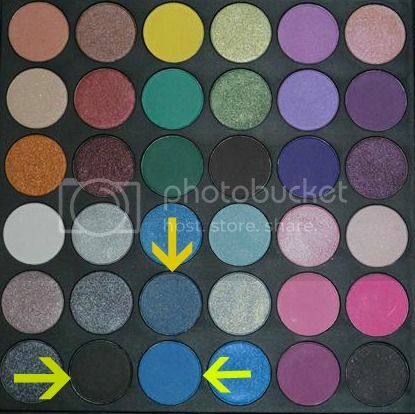 I decided too use the blue in the Maybelline quad as well as Velocity, and I used a mixture of colors from the Crown Cosmetics Smokey Eye Palette. The three shadows with the arrows pointing too the are the ones I used. I didn't use them in any particular order, except tap my brush into each a couple of times. I added that into the crease and blended out. BUT wait! There's more. 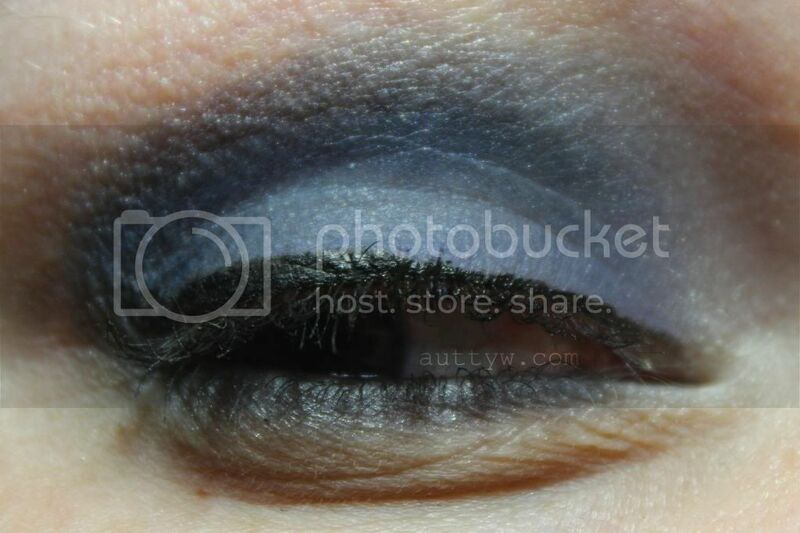 I also used Sugarpill Velocity in the crease. I used it as the original outline of the crease then I blended a bit on the top of the crease to give it a little something extra,. On the lid I applied lightly the Royal Blue from the Maybelline Electric Blues palette. I should have added some of Velocity on top, but what is done is done. 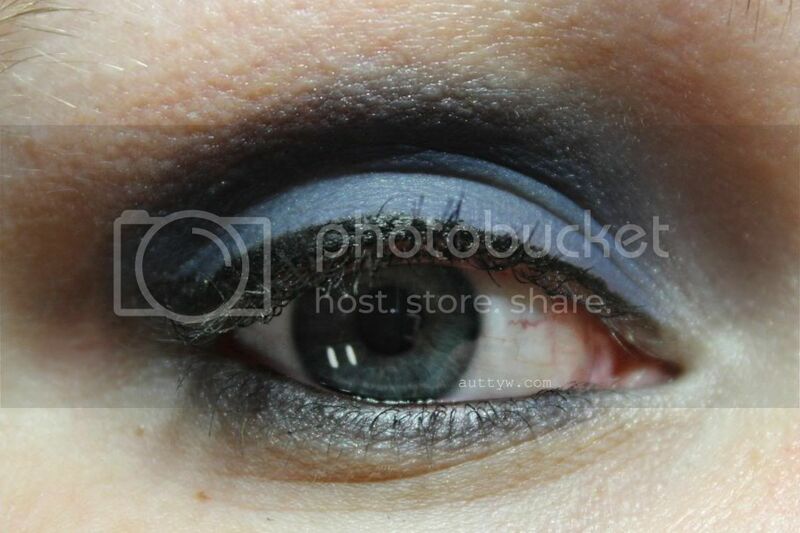 On the lower lashline I mixed the royal blue and the black shadow and smudged it across. You are probably asking yourself WHY so many pictures and WHY pictures of both eyes. WELL my dears, I did both eyes different. 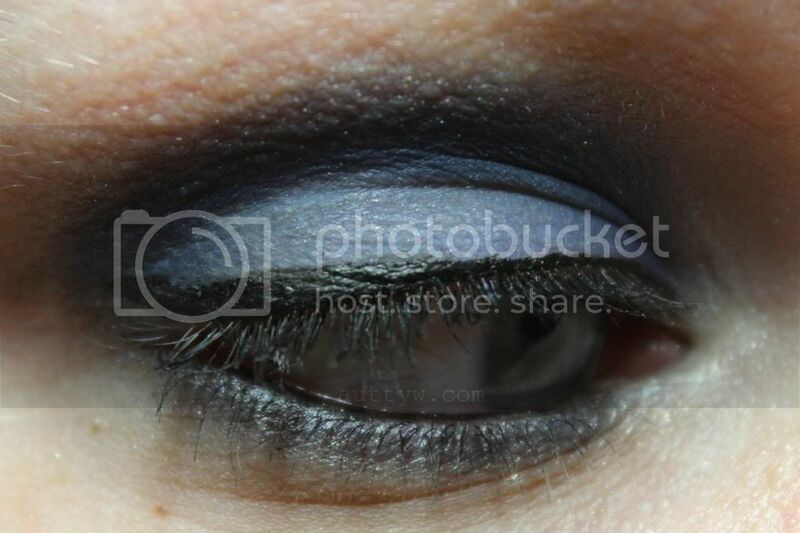 On my left eye I didn't wing the liner and I didn't bring the shadow up as high as I did on the other eye. You can't tell particularly but the liner on my right eye *below* is winged out and I brought the shadows higher up towards the brow bone. I really love how this came out! I've been itching too show everyone the look since I completed it a couple of nights ago! Here's the finished look with the whole face! ... I don't know why I said it that way but I did. A lot of people say don't wear blue on blue, brown on brown or green on green. I say, do what you want, it is your makeup and it's YOUR face. Makeup is an expression of art, don't let others dull your shine! Don't forget too check out the other ladies in the linkup and leave comments on their posts! Nice royal blue eyeshadow choice! It looks lovely on the eyes too. this blue looks great against your eye color. your eyes look so teal! Oohh it's so attractive on you! Yay for blue shadows!! Looks good! Wow what beautiful blue eyes you have! 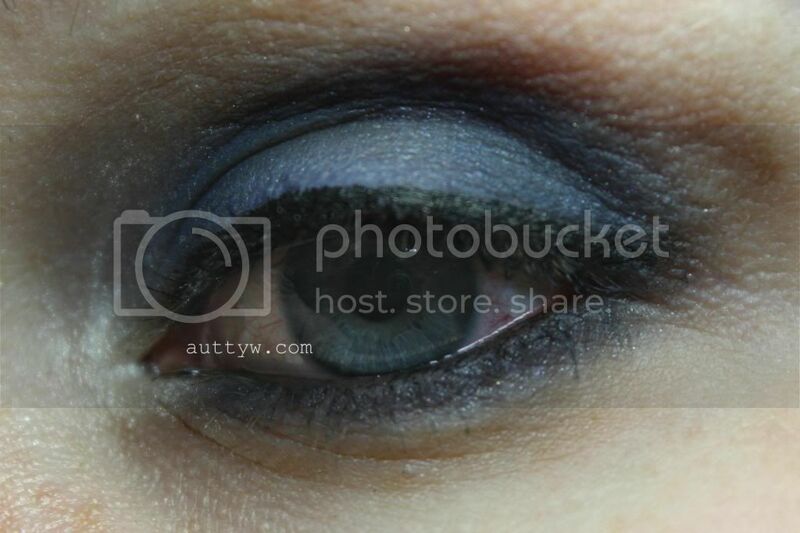 The blue shadow even accentuates them even more. Fantastic! So pretty! I need to brave the world of darker shadows...this is so pretty on you! I've been hearing a lot about sugarpill lately... I need to check them out. fantastic look - it really makes your eyes pop, too! Wow! So I tend to shy away from blues on my eyes (but apparently can't stay away from purple! ), but you really pulled it off. Your eyes really pop! Thank you so much!!! :D <3 You should definitely try some blues! I think they would look AMAZING with your eyes!! I LOVE wearing purples as well! I typically do a better wing, but I've been using my liquid liner instead of my cream liner. You should! Their shadows are amazing! Thank you so much! There is nothing to be afraid of, I bet dark shadows would look amazing on you! Thank you so much!! :D It's crazy how this made my eyes look brighter instead of more pale like they typically do! I was so excited that I wasn't the only one! Thank you so much! Thank you so much!! I'm going too check it out now! I've been a bit behind readin posts! It's all about manipulating your eye color! I LOVE doing looks that bring out the other colors that are in my eyes! 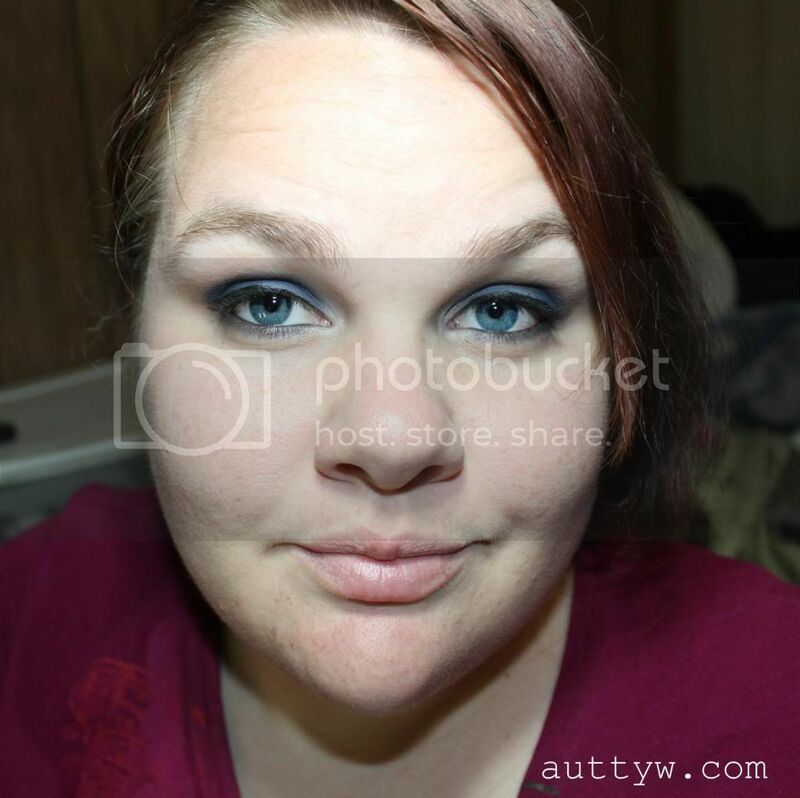 Love the look(s) you did :) I wish I had blue eyes to go with my blue eye look! This look just makes your eyes POP! So pretty!!! What a great look!!! I need to start getting more into make up! Thank you so much! You should! I'd love to see some makeup looks from you!